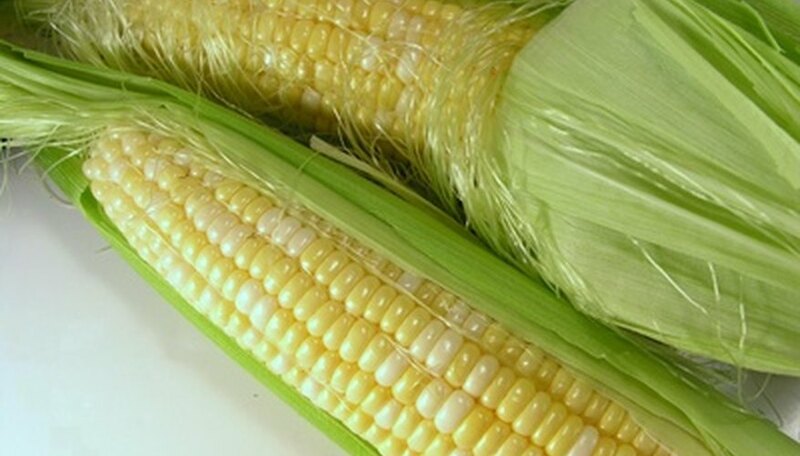 Minnesotans relish their home-grown ears of sweet corn in mid-July and August, if sown just after the threat of frost in late May. Choose a sunny garden site with deep fertile soil that remains moist but never becomes soggy or flooded after a rainfall. Lightly hoeing the soil around the corn plants removes competing weeds and planting corn in massed clusters or blocks improves pollination rates, better than if planted in long singular rows. Till the garden area earmarked for sweet corn planting with a garden shovel or rototiller to a depth of 8 to 12 inches. In Minnesota, do this in early May and then allow the soil to naturally settle for one to two weeks before planting, when there is no danger of frost. Open the corn seed packet and roughly count the number of seeds. Portion these seeds into two or three evenly numbered lots. You will plant the first group of seeds today, and the others later on in sequential plantings. Create a shallow hole or furrow row with the hole to a depth of 1 inch. Place a seed in the hole or furrow, making sure any additional seeds rest no closer than 8 to 12 inches. Replace the soil atop the seeds in the hole or furrow, ensuring the seeds remain at a depth of no more than 1 inch below the soil surface. Tamp the soil down atop the seeds gently with the flat backside of the hoe. Apply 1/2 inch of water from a sprinkling can to the area to moisten the soil surrounding the seeds. Scratch a new row of holes or furrow 30 to 36 inches from the previous plantings in order to create a spacious walking area between the sweet corn rows. Repeat Steps 3 through 5 until all seeds are sown. Irrigate the garden if natural rainfall fails to provide at least 1 inch of water to the sweet corn weekly. Plant the next apportionment of sweet corn seeds 10 to 14 days later, following Steps 2 through 8. Repeat again until all sweet corn seeds you wish to sow this growing season find a spot in the garden. Monitor the sweet corn seedlings and maturing plants over the next two to three months. Cultivate the soil around the corn with a hoe to eliminate weeds. Do not scratch the soil too closely to the base of the corn so you do not cut and damage the plant's roots. Harvest sweet corn cobs once the silky hairs at the apex of the cobs are beginning to dry and tan. Pull back the husk partially to view the kernels and examine them. Avoid exposing the corn cob kernels as this creates an easy way for insects to invade the cob and devour it before you get to harvest it. Remove harvested sweet corn plants at any time after the cob was removed. It will not produce another cob. Many gardeners simply abandon maintenance of the sweet corn patch after the crops, and let the frost kill plants in autumn before yanking and putting in the compos pile. Don't plant different sweet corn varieties or other types of corn, like Indian corn or popcorn, within 100 to 250 feet of sweet corn. This prevents cross-pollination and the awkward kernel firming or blended, starchy flavors not expected of sweet corn. Wash your hands after sowing sweet corn seeds, as they typically are coated in pink anti-fungal chemicals. Also, children and pets must not touch or eat these seeds. Don't sow your seeds too early in May in Minnesota. A late frost kills an emerged corn seedling. Wait until after May 15 in southern Minnesota, and the first week in June in more northern counties.